It is a common concept that the game of roulette is as old as the wheel itself. In fact, there are different theories about the origin of the game itself, but it is not a secret that France is at the heart of everything. The wheel itself is invented by the French physicist and mathematician Pascal, but his aim was different. He wanted to invent a machine in perpetual motion instead of a casino game. His attempt failed, but something good came out of it – an amazing and thrilling casino game. In fact, two French brothers developed the idea of Pascal and turned the spinning device in the well-known wheel. Unfortunately, the gambling was illegal at that time in France, so the two brothers introduced the game in front of the German gambling community. In fact, the idea was more than welcomed and thus they opened a casino in Hamburg. That is how the game “conquered” all hearts in Europe. Later on, roulette was brought back to its initial home. The structure of the wheel remained mostly unchanged, with the slight difference that a zero-numbered pocket was introduced. At first sight, it may look as an inconspicuous change, but it definitely affects the whole game. Roulette continued to travel around the world and its popularity never ceased to grow. The game made its way across the ocean and it was introduced in front of the American society. The only problem was the low profit of the house. In an attempt to increase the overall profit, also known as house edge, a double zero pocket was added to the American wheel. Nowadays, they still keep that difference and that is why we can outline 3 main variations of the game – French, European and American. Even though all of them are played by the same basic rules, there are certain differences that you should understand before you start to play roulette. French roulette is what you might call the “original” one. In fact, “roulette” means a “little wheel” in French. The wheel itself is just the same like in the European variation of the game. It consists of 37 pockets, which represents all the numbers from 0 to 36. They are arranged in a way, so that a high number (from 19 to 36) is positioned next to a low one (from 1 to 18). The pockets are colored alternately in black and red, except the zero-numbered pocket, which is in green. What is more interesting is the arrangement of the table itself. In some casinos, you can see that the wheel on the French table is in the middle. Therefore, the betting layout is also positioned in a different way. The outside betting field is split into two and it is located along the both sides of the table. Its unique betting field provides a better access to the layout and the possibility for more people to join. However, just because it is the original version does not mean it is the most popular. In fact, it is just the opposite. The reason is that French roulette offers good odds and a relatively low house advantage. Thus, many casinos prefer not to offer it, as they make less money from it. The presence of only one zero pocket decreases the house edge to 2.7%. What is more is that there are certain rules, which can even halve the edge to 1.35%. The rule is in effect when the player has placed an even-money outside bet and the ball lands on the zero pocket. Then, the player has the right to keep the bet unchanged for the next spin. If the ball lands again on the zero pocket, then the bet is lost. Otherwise, the bet has chances to either win or lose in accordance with the usual rules of the game. In a nutshell, in case that the ball lands on the zero pocket, the player splits the bet with the house. So, you can get back half of the stake and give the other half to the casino. Similar to the En Prison rule, this one is in effect only if you have placed an even-money outside bet. That is the reason why the French table is said to be more advantageous for the player. It provides not only one zero-numbered pocket, but also an option to “save” your bet (or at least part of it) if the ball finds its way namely in that pocket. As an additional plus, the French table offers some very exciting betting options, which are placed on all the numbers from a particular section of the wheel. These are well-known as “call bets” or “announced bets”. The name is significant enough to understand that these bets are everything else, but usual ones. The player only needs to announce the preferred bet and the dealer places the chips. To be more accurate, there is a slight difference between “call bets” and “announced bets”. “Call bets” are also referred to as bets on credit, because there are no chips, which cover the bet. That is why in most of the casinos these are prohibited. The only difference between the two types of bets is that with the “announced bets”, there are chips on the table. These bets can be placed till the croupier says “no more bets” and before the ball lands on a certain pocket of the wheel. There are various types of “call bets”, which offer different payouts and cover a big portion of the layout. Even though the names of the bets are in French, one can easily grasp the main idea behind them. If you play in an online casino, there is no real need to memorize the names or number combinations of these bets, as there are almost always explanations to go along with each bet. Generally, there will be some sort of drop-down menu under a “Call Bet” button, and when you select one of the bets, you will be given an explanation of that bet. The European and French tables overlap to a great extent, thus many people even do not find a difference between these two. In both variations, the wheel is constructed in the same way, offering only one single-zero pocket. Therefore, the house edge is also 2.7% on all bets. Even though the wordings on the French table are in French, this should not bother your mind, since the bets are the same. The only exception is that the European tables do not offer the additional betting options and the advantageous rules (or at least most of them), which can be found in the French variation of the game. It should be noted that in some casinos, the French “peculiarities” are also valid on the European table. Hence, before approaching the roulette table, make sure that you are familiar with the rules, that are managing the particular table. The European variation of the game is the most popular and it is offered by every reputable online casino. American roulette is by far the second most commonly found roulette variation. It offers a better advantage for the house. The wheel consists of 38 numbered pockets, which represent all the numbers from 0 to 36 and one additional double-zero pocket. Namely the second zero-pocket is decisive for the higher house edge, which is 5.26%. Thus, the probability for winning is slightly lower compared to the European variation. For example, you place a straight-up bet on the number 17. So, you have only 1 chance to win as opposed to the 37 to lose. Whereas, the single-zero wheel offers better chances for the player to win. Let’s take again the example with the straight-up bet. On the French or European table, you have 1 chance to win as opposed to 36 chances to lose. The numbers on the American wheel seem to be arranged in a more systematic way. 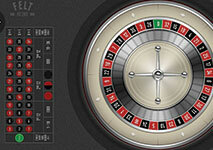 Looking at the wheel, every player can easily spot that 2 consecutive numbers are positioned opposite to one other. The presence of the additional zero pocket on the American wheel leads to a slight difference between the European and American betting layout. The American layout is double-ended, because it has an additional box, which represents the double-zero pocket. It should be mentioned that it is impossible to find an American table managed by the advantageous French rules. Luckily, players can benefit from the so-called “Surrender” rule, which is pretty much the same as the “Le Partage” rule. In fact, it comes in effect when the ball lands on one of the two zero-numbered pockets. The house edge is reduced from 5.26% to 2.63% for all even-money outside bets. The bets are the same as in the European variation of the game, with the only exception that the American table offers the so-called Five-Number bet. It boosts the house edge to 7.90%, thus players are recommended to avoid this bet, because the payout is only 6 to 1. Interesting enough is that many players prefer to play in an online casino, since they are not distracted by any noises. No matter which variation you choose, every table provides different minimum and maximum limits, which can fit every bankroll size. Moreover, most of the online casinos offer a statistics, reflecting the so-called “hot” and “cold” numbers. The concept behind these numbers is really logical. “Hot” numbers come up most frequently, while the “cold numbers” come up most rarely. It seems that many players value this information and apply it when placing a bet. Since technologies are advancing day by day, it is a matter of fact that online casinos offer very entertaining variations of the game, which are everything else, but standard. This variation of roulette is one of the most appealing to the players. It is played by the same rules, which are governing the European single-zero pocket. 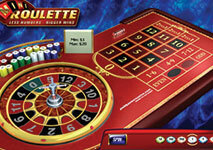 But the exceptional part is that roulette royale offers a solid progressive jackpot, which is really tempting. In fact, all players are required to place side bets, which are added to the amount of the jackpot. Thus, the more players join, the higher the jackpot is. This jackpot can be won if the same number is hit 5 times in a row. The chances are not very high, but it is worth a try. If a particular number is hit two, three or four times in a row, then the payout is less. All players, who highly value the aestheticism, should try the 3D variation of the game. The game itself is governed by the same rules as the European variation, but the graphic design provides second-to-none experience. To make it even more plausible, the play offers also sound effects. The standard single-zero wheel is positioned in the middle of the screen and the layout is just above it. Of course, it also provides additional settings, so that every player can adjust the overall picture in accordance with the personal preferences. A great advantage of this variation of the game is that it provides information about the number of players, who have won a certain bet. Marvel enthusiasts will adore this variation of the game, since it utilizes the Marvel comic heroes. It is played in accordance with the standard European rules. The wheel consists of only one zero-numbered pocket, but it also offers a blue pocket, which represents the Marvel Bonus. If you place a bet on the blue box and you win it, then you can play a bonus slot game, where you can win one of the four Marvel Progressive Jackpots. 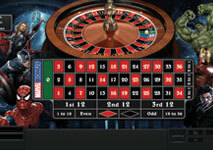 Known as one of the most advantageous online variation of the game, the multi-wheel roulette is played on six different wheels, each of which consists of only one zero-numbered pocket. The players can cover all the wheels with a single bet. Of course, if you do not feel like playing on six wheels simultaneously, there is an option to deactivate some of the wheels. This is also a unique variation of the game, which is played with 2 balls. It is offered in most of the online casinos, but one should keep in mind that it is played in real time. Therefore, you can find the game in the Live Dealer section. Even though the winning numbers will be two, the outside bets are also possible here. For example, you place a bet on all the red numbers, hence the two balls should land on red pockets. The players, who would like to give it a try, have the option to choose between a single-zero or double-zero wheel. 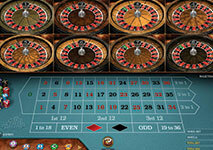 This variation of the game follows the main basic rules of the standard roulette. The difference comes from the wheel, which contains 13 pockets for the all the numbers from 0 to 12. It should be noted that the zero pocket is in blue color. The presence of a limited number of pockets increases the chance for the ball to rest on the zero pocket. But there is a rule, which allows the players to retain half of their bets under certain terms. The payouts are also affected due to the number of the pockets. This variation of the game offers an authentic wheel, inspired by the design of Mark VII. It consists of an inner and outer ring, each representing its own set of numbers. The two rings are positioned opposite each other, so the winning numbers are two. This variation also offers different betting layout. It consists of two main sections, each presenting the different rings on the wheel. Outside bets are also possible here, but the preferred wager needs to come up on both rings. Roulette provides great diversity, which can match the individual preferences of everybody. Obviously, most of the variations are played by the same rules, but every player should be familiar with the slight differences. To choose which variation is the best for you, do not put yourself limits, but give it a try.